Anyone who has ever moved before, knows that relocating to a new apartment or home is a stressful and tiring process with an endless list of things to do. So to help ease their anxiety and perhaps add some charming décor, why not send your special recipient a lovely floral bouquet or great gift basket? Below are some of our Unique Housewarming Gift Ideas that will make them smile with kindness and gratitude for such wonderful friends. Add a bit of exotic elegance to any home or office with this simple, yet beautiful palm plant that is carefully hand-arranged in a keepsake planter. Measuring approximately 26H x 12W, this lovely arrangement will offer peace and serenity to your special recipient in their new home, and is available for same-day delivery. Our Loving French features a dieffenbachia plant, English ivy plant, pink kalanchoe, and a palm plant which are beautifully arranged in a keepsake basket. Measuring approximately 20"H x 8"W, this is the perfect gift for new apartment or homeowners, as it is a lovely and long-lasting gift. 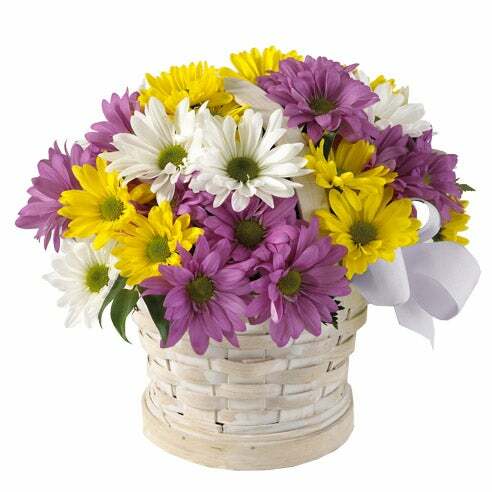 Our Daisy Delight Basket featuring lavender daisies, white daisies, and yellow daisies is a beautiful housewarming gift that will make your special recipient smile with delight. Hand-arranged in a white-washed basket, this bouquet is a charming display of floral beauty, and is available for same-day delivery. 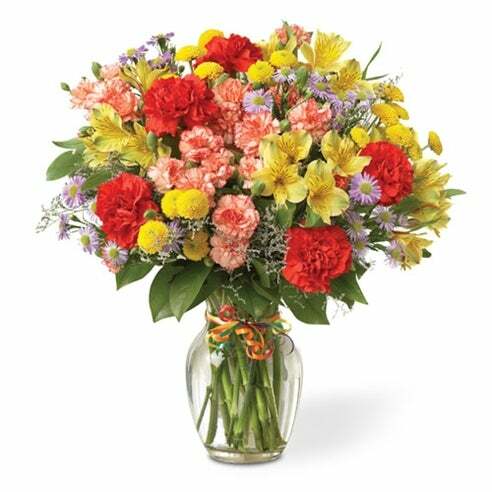 Our Celebrate Every Day Bouquet is a fun and vibrant floral arrangement featuring colorful poms, red carnations, and yellow alstroemeria. Situated in a glass vase with a decorative ribbon, this makes for a perfect housewarming gift that will send a message of your most heartfelt wishes. If you are looking for a gift that will offer comfort and serenity after a long move, look no further than our Kalanchoe & Fruit Basket. A hot pink kalanchoe plant and variety of fresh fruit are delivered in a whitewash woodchip basket measuring about 13"H x 13"W, which provides both beauty and sustenance. All of our floral arrangements can be delivered same-day to their home, so be sure to check out the rest of our Housewarming Flowers & Gifts to find the perfect gift to express your heartfelt wishes for happiness in a new home environment.